Rubbish, garbage, refuse, trash, junk, muck, dregs, detritus – so many words to describe what we throw out as useless. Many capture the underlying meaning better than “waste”, which can equally mean throwing out something of value. No surprise, then, that words like “recycling” are now needed to describe the same thing. Here in our island, the word has a special resonance because of our awkward history of dealing with it. For many decades, the stuff we threw out was tipped into holes and we dignified it with the name landfill. Happily, the original digging of the holes was for another purpose, namely quarrying. But that industry duly passed, save for the extraction still undertaken by Ronez. Basically we have run out of holes. That has meant the disposal of our waste has been a big political issue for well over 25 years, and an expensive one too. We spent a good part of that time investigating investment in a large incinerator, and even reached agreement, twice, with a contractor to build it. By the time those fell through, we ended up spending approximately £12 million. Our incinerator decision looked less problematic when Jersey went ahead and built one. We didn’t go into a joint venture with them on it, nor even agree to supply waste material to keep their underutilised unit topped up, as their tender was uncompetitive. Instead we opted to undertake maximum separation and recycling and to send residual waste elsewhere – initially with an end destination of Sweden. Fast forward nearly 10 years from when an incinerator was last proposed, and we now have a have full-on recycling and a processing plant where the incinerator would have been. It is significantly smaller in scale, thankfully, but just as unattractive. The decision represents a step-change in philosophy, based on a so-called “Waste Hierarchy”, which is more about managing resources than waste and focuses on prevention and re-use ahead of recycling and recovery in order to minimise environmental and economic costs. Unsurprisingly, the issue of financial cost has been at the front of islanders’ minds during this transition, which initially saw the introduction of kerbside recycling and the levying of surcharges to use the landfill. Later there was much noisy debate over whether charges should be levied by the parishes or by the States, and over the split between fixed and variable cost components. When the bills started landing on islanders’ doormats earlier this year, it was confirmation that the days of modest annual waste charges had ended. That is because responsible treatment of waste requires significant capital investment in plant and equipment and large sums to be paid out of general revenue or earned from charges on commercial and residential users. Originally, the perception was that a heat treatment solution (incineration) would have been far simpler and cheaper. This is only half true. Heat treatment would be simpler than separation and extraction: we could continue to discard what we didn’t want without having to consider the separation of materials, and we didn’t need to confront any incentive to manage waste better. But technically heat treatment is more complex and the capital cost significantly greater, even without taking account of the environmental cost. Instead, the States opted to invest in a waste transfer station which would receive and bale commercial and household waste. The Waste Transfer Station was budgeted at £28m, and came in on target. The installed cost of the capital equipment for the transfer station is an estimated £90m cheaper (based on RPI differentials from 2010-2018) than the 2010 capital cost of the heat treatment facility. Include interest charges plus capital repayments over 25 years borrowing from the States, and savings over its expected life amount to approximately £140m. Against this, from an operational perspective, the waste transfer station costs are amplified by shipping charges to export recycled material including refuse derived fuel (RDF) and food slurry – known in the industry as “AD soup.” On the other hand the incinerator faced highly uncertain ash disposal costs, and plant maintenance beyond the first two years was not guaranteed. The controversy over our indecision regarding waste management is one thing, but as a visit to the facility demonstrates, the waste transfer station is not simply another expensive and unnecessary capital cost. It is doing the job that was intended. The transfer station building is divided into three distinct areas of broadly equal size covering (i) food waste from commercial entities and households (ii) mixed bag waste from commercial entities and households, and (iii) mechanical separation and baling into RDF. Glass is also delivered separately and shipped uncrushed to enable sorting. Food waste is delivered to the transfer station by collection vehicles bringing in around 10-15 tons per day. This is fed into a shredding facility separates plastic bags and other contaminants from the food, and reduces particle size to less than 12mm to conform with animal bi-product regulations. The resulting “soup” is pumped into 35,000 litre container-sized tanks. Three to four of these per week are shipped by Lo-Lo cargo ship to Poole for onward shipment to an Anaerobic Digestion facility in Wiltshire. In total, annual shipments are expected to be in the region of 4,000 tons pa.
Mixed waste, commonly known as “black bag” waste, is potentially the most problematic part of the waste stream, as it is important that the composition of the waste is relatively homogeneous, and not contaminated with inappropriate material which should have been separated or sorted previously. Currently, households are managing to separate a large proportion of food waste, but waste from commercial sources is of inferior quality and tends to be more mixed. Guernsey Waste (part of States Trading Assets) is encouraging commercial operators to take greater care over separation of materials and advising how not to generate waste material in the first place. The principal purpose of separation is to ensure that “the right stuff goes down the right track” to ensure that the residual “stuff” is of the highest quality. RDF production, typically focused on black bag type waste. This stream is fed into the processing plant which shreds the waste and extracts recoverable metals, both ferrous (eg. steel) and non-ferrous (eg. aluminium). The residual waste is baled into RDF for shipment off island by curtain-sider trailer for eventual energy recovery. The residual waste stream has shrunk to around 10,000 tons pa, much less than the expected 25,000 tonnes originally envisaged. On a like-for-like basis residual or tipped waste in 2008 was around 35,000 tons pa, which indicates the scale of reduction achieved. The RDF is equivalent to 2-4 trailers per day, and is shipped via Ro-Ro to Portsmouth, transferred by road to Kent, and then shipped onwards to Sweden. In time it may go elsewhere when contracts are eventually renewed or renegotiated. So, what can we say at this early stage of the plant’s operation? We see high levels of source segregation of waste, in particular household waste, to remove recyclables prior to collection. This means overall throughput is lower than expected and therefore a lower volume of residuals is treated and shipped. The processing plant is currently operating at an undemanding seven hours per day, with ample spare capacity. Households are generally performing better than commercial users at separation. Users generally are incentivised to minimise and separate waste by the linking of the charging structure to the volumes of waste discarded, encouraging users to “do the right thing”. The evidence suggests that affluent areas are as likely to see low engagement as less affluent areas. Overall, though, most areas have high engagement – more than 85% of households are now regular users of kerbside recycling and nearly 90% use the food waste collections. Waste collections are expected to improve as collection vehicles migrate to “split body” types which can collect multiple waste streams in a single pass. One major contractor is already using these vehicles. Meanwhile Guernsey Waste is working with parish collection contractors to further reduce noise intrusion, especially for glass collections, in more urban areas. 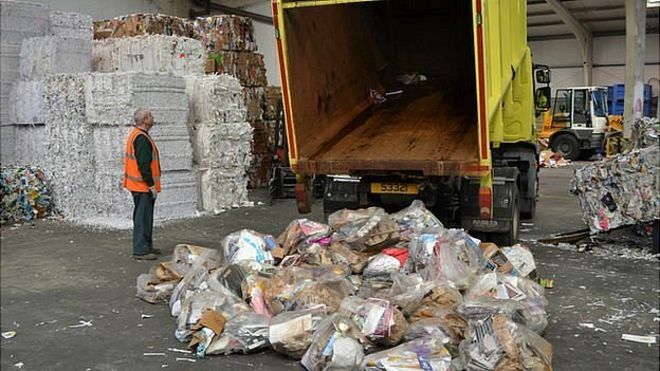 Guernsey Waste expects recycling rates to improve from 50% in 2018 to more than 60% this year. If achieved this will approach the best in Europe. Guernsey has, in the main, embraced the behavioural changes required to achieve high recycling rates. We still have further scope to improve recycling rates with the current infrastructure, possibly to as high as 75%. What of the future? Waste costs money. Take the relevant EU directive for electrical goods, for example. This requires the cost of proper disposal to be included in the purchase price of the equipment. However, most industries produce material goods with no consideration of the cost of disposal. This is left to be solved by the public sector – meaning in Guernsey the States and parishes. For plastic bottles or other disposable products, a deposit return scheme would probably increase recycling rates. Likewise with hardy, non-biodegradable materials manufactured for single-use. Dealing with this material is costly. Waste has to go somewhere. We talk of throwing things away but there is no “away.” Everything we buy eventually turns to waste, but each material has a different useful lifespan. A window and window frame might last 30 years. A soft-drink bottle might be useful to the consumer for only ten minutes. Ultimately, we have to arrive at a circular economy where the purchase price of any good is sufficient to pay for the full lifecycle of the product. Otherwise, the public sector will have to shoulder the cost of dealing with the waste generated. When we all understand this, we might be more thoughtful in how the product is designed and how its materials can be returned to the economy as new resources.